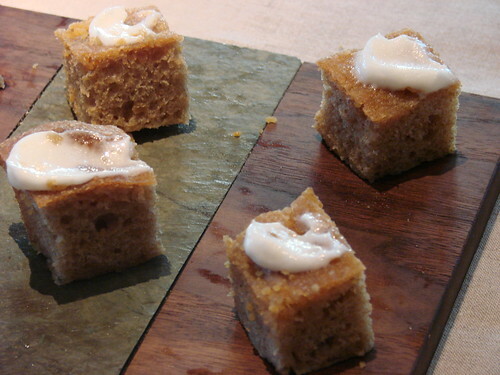 Blondie and Brownie: And This Little Piggy Went "Oink, Oink"
Happy Blogversary to us! It's been a little over two years now and to celebrate we decided to hit up Cochon 555 for some piggie oink-oink-into-my-belly action. Except it was gorgeous out and one of us is super-preggo, leading both of us to be later than late and missing out on some good eats. By the time we arrived, Cafe Boulud and Gavin Kaysen were long cleaned out. Always excited to get some spicy food, we loitered way too long at Fatty 'Cue while Adam Kaye and Blue Hill at Stone Barns were serving up their last bits. Yes, we only got to taste three of the five there, but that was more than enough for us. 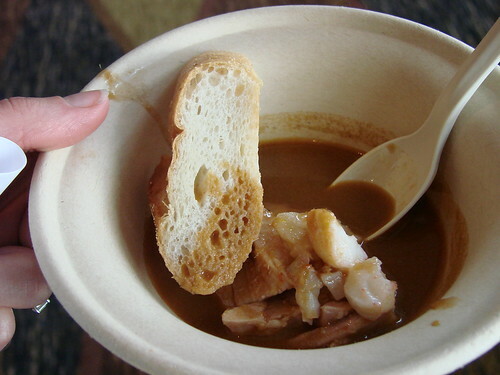 Corwin Kave and Fatty 'Cue's was by far the spiciest: chunks of pig in a red lobster curry, with a slice of bread for soaking. Both of us experienced mouth en fuego, and still went back for seconds, and okay, maybe thirds too. Mark Ladner and Del Posto served up a 1000-layer cold lasagna with hot sauce. 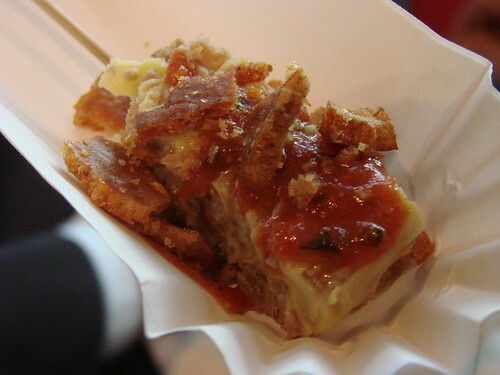 As lovers of any food on a stick, we loved this, lasagna on a stick. 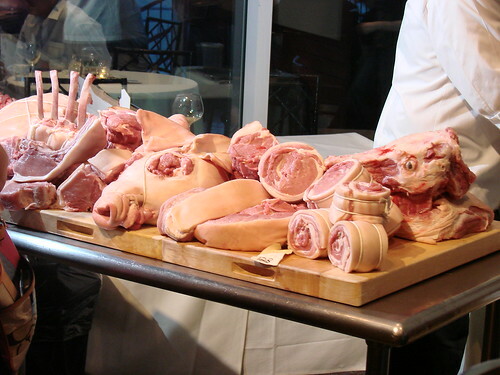 Even more because it had 50 layers of pig. 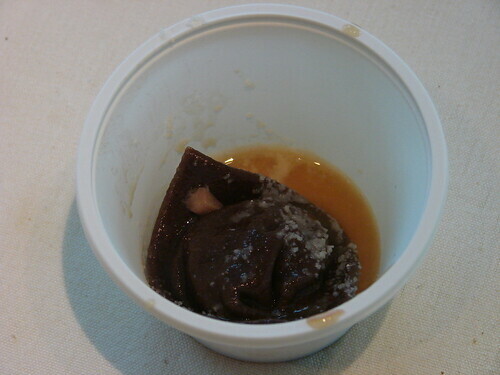 Marco Canora and Hearth were running low, only having their chocolate ravioli stuffed with porcine goodness. You could leave the chocolate, I'll take the pig. Now Blue Hill did something peculiar after running out of food, they kept serving. Not their main dish, just pork bread with lardo. Warm dish after warm dish, I believe this helped swing some popular votes since no matter when you went to their table, there was always food even if it wasn't what the judges ate. Because at the end of the night, they did crown a new Prince of Porc, all hail Adam Kaye. 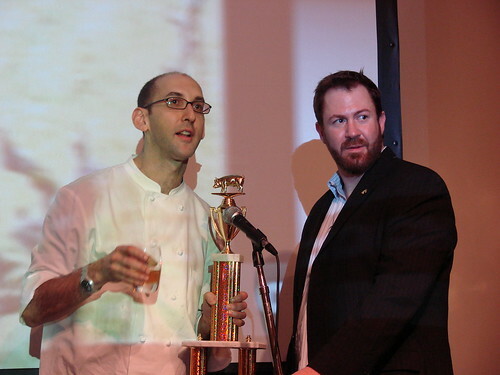 For all things Cochon 555 related, be sure to check out www.cochon555.com. The tour goes on until the end of June.